Graeters makes one of my favorite ice creams – Black Raspberry with Chocolate Chunks! 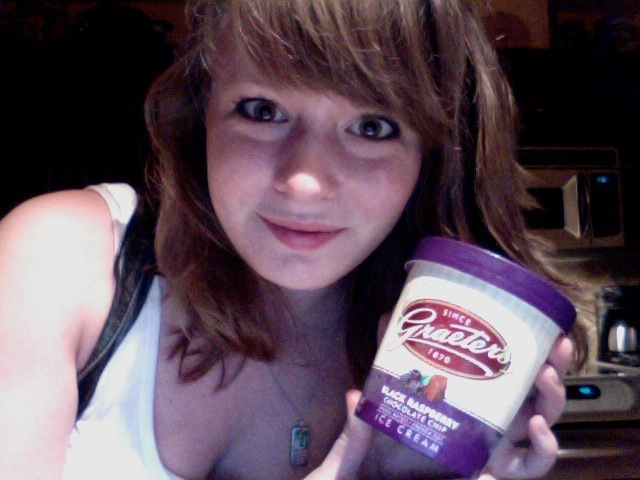 Graeters ice cream is one of my favorite frozen treats. Every time we visit Kentucky, we take a special trip to a nearby Graeters location. Nearly everyone gets the Black Raspberry Chocolate Chip Chunk flavor, and it is just so divine. The texture is luscious, and the flavor is amazing with the perfect balance of sweet and slightly tart. The chocolate pieces are HUGE, and you often consider whether or not they actually break the chocolate bars up before adding them to the ice cream! The best part about this ice cream is when you take a bite and get a huge piece of chocolate. So, imagine my surprise and sheer delight when my Dad brought a pint of this home! Here in Arizona!! I am not joking with you, they now package it and sell it at stores nationwide. We currently buy ours from Frys (Kroger). I’m so smitten… Go try some for yourself!